**Please make sure all equipment is properly shutdown and stored correctly by monitors at the end of the day. If students borrow dividers, please make sure they are put away. Everyone should clean up their area including floor, discard un-necessary papers and put chairs up at the end of the day. Thank you for your time and help. Hope you have a great day. Period One: Music prep-students drop off book bags and unpack. Stream down to the music room on your own. Period Two: Reading workshop: Legends. I CAN DEEPEN MY UNDERSTANDING OF LEGENDS BY IDENTIFYING WHICH REAL LIFE PERSON OR EVENT IT IS DESCRIBING. • Legends are stories that have been handed down from generation to generation. • They are based on the life of a real person or event. (Ex: Robin Hood, John Henry, Mulan, etc). • Legends have more historical truth and less fiction than other types of Folk Literature. • Legends were often used to teach cultural values. Read together John Henry legend. 1. Legends are based on the lives of real people. On whom is this legend based? 2. What did the main character do that he or she could not do in real life? 3. What life lesson or cultural values does this teach or address? How do you know? 4. CREATE A SUMMARY IN YOUR READING NOTEBOOK BY USING THE SWBST MODEL. (Make sure you state lesson learned). ALL: CIVIL RIGHTS LITERARY ESSAYS DUE WEDNESDAY, MARCH 20TH. Task was distributed in class and is also posted in the reading workshop section of the website. ​5-315: SEE ABOVE. THIS COULD BE YOUR WRITING ENTRY IF YOU DO IN NARRATIVE FORMAT...STORY OF STUFF RESPONSE IS DUE Wednesday. ANSWER AT LEAST SIX QUESTIONS SPECIFICALLY OR WRITE A NARRATIVE RESPONSE--AT LEAST TWO LONG PARAGRAPHS THAT ADDRESSES AS MANY OF THE QUESTIONS AS POSSIBLE. You may also work on ELA-Iready. Period Four: Clubs-Students may work on ELA I-ready or any other assigned tasks. Please circulate to make sure they are on-task especially the boys. Period Five: Lunch--pick up class 5-313 in lunchroom at 12:50 p.m.
Period Six: : Reading workshop: Tall Tales. I can deepen my understanding of tall tales by focusing on how the story is exaggerated. The main character is a super-human-larger than life figure with a specific job. • The story is exaggerated. • Tall Tales are usually humorous (funny). • In Tall Tales American frontier life is exaggerated. • Dialect and everyday language is used in Tall Tales. 1. Who is the superhuman hero-character in this tale? 2. Re-tell one of the humorous parts. 3. Tall tales have exaggeration. Tell one part of exaggeration in this story. Period Seven: CIVIL RIGHTS LITERARY ESSAYS DUE WEDNESDAY, MARCH 20TH. Task was distributed in class and is also posted in the reading workshop section of the website. What actions can individuals take to respond to an issue they care about? (You may cite specific evidence from any of the two articles you have read). What issue or issues in your community do you notice? • What steps could local people take to work on that issue? ​Design your own test prep question based on this passage. Label it right there, think and search, author and me or on my own. Provide four choices. READ AND WRITE A 40-50 WORD SUMMARY (USING 5 W'S AND 1 H) ALONG WITH YOUR PERSONAL RESPONSE TO THE STORY) DO IN YOUR NOTEBOOKS AND GET CHECKED! MONDAY, FEBRUARY 11: https://newsela.com/read/minnijean-brown-trickey-school-items/id/48874/write/ I can deepen my understanding of the Civil Rights era by responding to an article on the Little Rock Nine.Write a short paragraph that explains the central idea of the article. Use at least two details from the article to support your response. (Don’t forget the 5 W’s and 1 h). WEDNESDAY, JANUARY 30TH: GOOD MORNING...I HAVE A STOMACH BUG AND WILL BE BACK WITH YOU TOMORROW. PLEASE OPEN THE POWERPOINT, WATCH THE VIDEO AND FOLLOW DIRECTIONS. UNDERNEATH, STOP AND JOT YOUR WONDERINGS. ALSO, USE NON-FICTION RUBRIC TO WRITE A SUMMARY THAT DESCRIBES THE SIGNIFICANCE OF THE GREENSBORO SIT INS. BE PREPARED TO DISCUSS TOMORROW IN A SOCRATIC SEMINAR. ANYONE THAT DID NOT FINISH I-READY, YOU MUST DO SO THIS MORNING....WORK ON CIVIL RIGHTS BOOK CLUB PACKET NUMBER ONE WHICH IS DUE MONDAY....YOU MAY ALSO WORK ON RAN CHARTS. YOU MAY NOT WORK ON RESPONSES TO BROWN VS BOARD OF ED UNTIL YOU FINISH GREENSBORO ACTIVITIES. WEDNESDAY, JANUARY 23RD: GOOD MORNING....I AM STILL ILL AND HOPE TO BE BACK WITH YOU TOMORROW....BE EXTRA GOOD TODAY...FOLLOW THE THREE B'S AND EMAIL ME DURING THE DAY IF YOU HAVE ANY QUESTIONS-CONCERNS...HAVE A GREAT DAY! I can deepen my understanding of important figures of the civil rights era by responding to an article about Supreme Court Justice, Thurgood Marshall. Pick a detail from this article. Explain how it helps you understand the bigger ideas in the article. Write out your answer. Stop and jot your response to the story. Period Three: Argumentative Essay Pre - Assessment. PLEASE SET TIMER. STUDENTS MUST COMPLETE IN 45 MINUTES--50 MINUTES MAXIMUM. Think of a topic or issue that you know and care about, an issue around which you have strong feelings. You have 45 minutes to write an opinion or argument text in which you will write your opinion or claim and tell reasons why you feel that way. When you do this, draw on everything you know about essays, persuasive letters, and reviews. If you want to use information from a book or another outside source, you may do so. When completed, print a copy (double sided) and leave on teacher’s desk. They should also share their files with me (via google docs). FOCUS BOYS AND GIRLS AND DO THE BEST YOU CAN! When completed, they may print a copy (double sided) and leave on teacher’s desk. They should also share their files with me (via google docs). Students who have completed I-ready assessment, may work on I-ready, Raz Kids and-or Grammaropolis. Click on the Wonders Tab. Pick any Wonder to read and answer the questions about it below. (see document). Period Seven: Nathan should finish I-ready Diagnostic. Others please work on Wonderopolis entry of your choice. 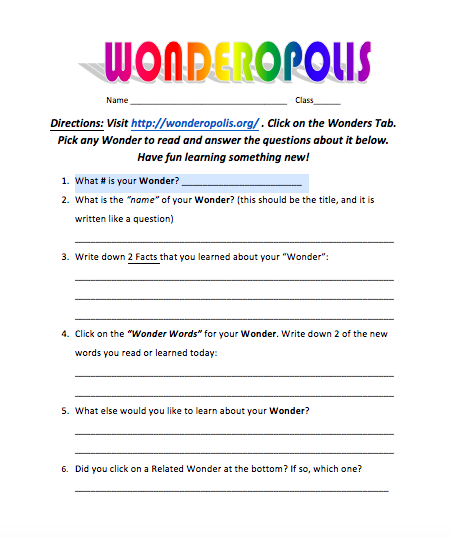 FINISH A WONDEROPOLIS ENTRY OF YOUR CHOICE AND USE THE WORD DOCUMENT TO GUIDE YOUR WORK. TUESDAY, JANUARY 22: GOOD MORNING. MRS. DAVIS IS ILL AND WON'T BE IN TODAY. PLEASE FOLLOW THE THREE B'S AND YOU CAN EMAIL ME DURING THE DAY IF YOU HAVE ANY QUESTIONS-CONCERNS. PLEASE TIDY UP AS WE ARE HAVING SPECIAL VISITORS IN THE BUILDING TOMORROW. THANKS AND HAVE A GREAT DAY! Please make sure all equipment is properly shutdown and stored at the end of the day. **PERSONAL FAVOR: WE ARE HAVING A VISIT FROM DEPUTY SUPERINTENDENT. SO IF POSSIBLE, PLEASE HAVE ERIC Z. AND-OR KATHERINE C. AND PATRICIA OR OTHER STUDENTS TAPE UP ANY SIGNS THAT FELL DOWN AND TIDY UP CLASSROOM. PLEASE TIDY UP AND RECYCLE ANY PAPERS YOU DON’T NEED AND PICK ANY GARBAGE UP OFF OF THE FLOOR. THANKS. Period Two: I-ready Diagnostic assessments. Get your fortress (desk divider) and stay on task. If done with I-ready Diagnostic, please complete assignment on Dogo News on Remembering the Life and Legacy of Mr. Martin Luther King Jr.
1) Why do Americans celebrate MLK's life and legacy? 2) Where was MLK born? 3) When did MLK realize that racial discrimination was not a normal way of life? 4) What job options did MLK have when he became minister? 5) What incident caused MLK to begin the fight against racial injustice in America? 6) What concerted effort helped end segregation on public transportation? 7) How did MLK ask Americans to protest against racial injustices? 8) What is MLK’s most famous speech? 9) What chain of events leading up to the address? 10) What laws helped end racial discrimination in the US? 11) Why was MLK not able to experience the reforms in America? 12) What does the author want everyone to do? Period Four: Clubs-Independent work. Kids can work on I-ready, Raz Kids or Grammaropolis. (The Grammaropolis passwords are in the F&P kit box located in the back of the class room). Period Five: Lunch. (Drop in auditorium and pick up in lunchroom at 12:50 p.m.
Period Six: (See period 2. Finishing I-ready Diagnostic is priority). Period Seven: (See period three). Period Eight: SEL check in. Move your sticker on board to identify how you are feeling. Think of a topic or issue that you know and care about, an issue around which you have strong feelings. Tomorrow you will have 45 minutes to write an opinion or argument text in which you will write your opinion or claim and tell reasons why you feel that way. When you do this, draw on everything you know about essays, persuasive letters, and reviews. If you want to find and use information from a book or another outside source, you may bring that with you tomorrow. FINISH LANGSTON HUGHES WORK IF YOU DIDN’T COMPLETE IN THE MORNING. PLEASE DO ASSIGNMENT POSTED IN DOGO NEWS ON CLASS WATER CRISIS. THERE'S SEVERAL QUESTIONS AND VOCABULARY WORK. YOU DO NOT HAVE TO COPY QUESTIONS IF YOU WRITE COMPLETE ANSWERS. THE NEWSELA ARTICLE TALKS ABOUT HOW THE FLINT WATER CRISIS IS AN ISSUE THAT GREATLY IMPACTS PEOPLE OF LOWER SOCIAL ECONOMIC CLASSES. FIND THE SECTION. EXPLAIN WHY THIS IS THE CASE. Period Two: Monitors should give out laptops. Have two students distribute dividers. Students should get headphones and take I-ready ELA assessment. Please stay on task. Students should also finish editing-revising their features and make sure they have two copies (preferably one in color) to hand in tomorrow. All drafts, rubric and checklist should be submitted in gallon size baggy. Begin feature article reflection which is posted in writing workshop section. It’s a word document. Students may type responses. Period Four: Clubs-independent. Students may do “regular” I-ready, Raz Kids or Grammaropolis. Again, circulate to ensure students are on task. Period Five: Lunch. Drop off in yard or auditorium and pick up class 5-315 in lunchroom at 12:50. Period Six: Distribute dividers. Feature final reflection. Document is posted in writing workshop section of website. Students must answer questions as thoughtfully and thoroughly as possible. Students should also finish editing-revising their features and make sure they have two copies (preferably one in color) to hand in tomorrow. All drafts, rubric and checklist should be submitted in gallon size baggy. Period Seven: (Please continue circulating to ensure students are on task). They may work on regular I-ready. DO NOT BEGIN DIAGNOSTIC, Raz Kids or Grammaropolis. Period Eight: SEL check in. Kids may move their patches on board to show how they are feeling. You can also ask them how their day went and have a few kids share. Usual reading homework and reminder that you should be spending at least 45 minutes a week on ELA I-ready website. Period Two: I can deepen my understanding of current events by responding to a DOGO news article on former president George HW Bush. Please answer at least 5 of the 10 comprehension questions, vocabulary in context (mandatory) and critical focus challenge (mandatory) questions posted on Dogo News in your social studies notebooks. You do not have to copy questions if you answer completely. Have fun with the vocabulary word search. You may use headphones to watch video and explore other articles in Dogo after completing the President Bush assignment. I have asked sub to give Dojo points to any students who complete activity. Period Three: Work on the drafts of your feature articles--keeping your angles in mind. Work on organizing information into your subheadings and make sure you have an engaging lead and informative nut graf. Many resources available in writing workshop section of the website. Carl Hiassen final packet due next Monday, December 17. If you did not complete A Day in the Life of an Inuit and-or any components of your webquest, please work on this and submit to your teacher. Period Seven: See period 3. Period 8: Make sure laptops are properly shutdown and put away with chargers. What do you notice as a writer? In other words, what are some distinct features of features? Stop and jot using bullets. CLASSWORK FOR MONDAY, NOVEMBER 25: I WILL SEE YOU TOMORROW. PLEASE COMPLETE READING TASK AND YOU MAY THEN WORK ON YOUR INUIT WEBQUEST, ELA-IREADY OR RAZ KIDS. STAY FOCUSED AND FOLLOW THE THREE B'S. Reading workshop: I can deepen my understanding of text by taking the leap from a character’s big problem to a bigger truth about life. What are the challenges or the problems that the main character is facing? What life lessons can be learned from the way the character responds to the difficulties? After you have found a few passages where the main character is facing a big problem, re-read those passages thinking about the decisions the author made. Why does the author have the character doing this? What do I notice about this passage? What stands out? How does this connect with earlier parts of the text? What message might the author be trying to communicate? What lesson about life is the author trying to teach? Either answer the above questions thoroughly and thoughtfully in complete sentences or write a double sided notebook entry in narrative format where you address what you notice. Make sure you include what the author might be saying about not only that character but also about people and life, in general. Please use reading response rubrics (posted in rubrics section of the class website) to guide your work. Remember, write in your reading notebook. Should you choose to type, make sure you print and put in your reading response notebook. You may share with Mrs. Davis but that is in addition to making sure work is in reading notebooks. Period Three: Inuit partnership webquest work. You may continue working with your partners. I can analyze ways in which the Inuit interactions with the environment led to the development of distinct customs, beliefs, and values by completing an Inuit webquest. RI.5.3: Explain the relationships or interactions between two or more individuals, events, ideas, or concepts in a historical, scientific, or technical text based on specific information in the text. RI.5.4: Determine the meaning of general academic and domain-specific words and phrases in a text relevant to a Grade 5 topic or subject area. SL.5.1: Engage effectively in a range of collaborative discussions (one-on-one, in groups, and teacher-led) with diverse partners on Grade 5 topics and texts, building on others’ ideas and expressing their own clearly. Identify and describe how environments affect human activities and how human activities affect physical environments. Describe how human activities alter places and regions in the Western Hemisphere. Period Four: Clubs-ELA I-ready. Use your headphones. Or you may work on RAZ Kids reading. Period Six: See Reading workshop from the AM. ​Period Seven: You may work on Inuit webquests, ELA I-ready or RAZ kids. ​PLEASE WORK ON YOUR STUDENT LED CONFERENCE FORMS....MAKE SURE YOU CHOOSE A SAMPLE OF YOUR WORK THAT YOU WANT TO CELEBRATE. BE PREPARED TO TELL WHY...I WILL SHARE SOME POSSIBLE GOALS-SUGGESTIONS SHORTLY. Students will write an informative essay-information piece-feature article about Hurricanes using evidence from the three sources provided and personal experience. Be sure to write in narrative format and paraphrase info in your own words! STUDENT LED CONFERENCE FORM--COMPLETE AS THOROUGHLY, THOUGHTFULLY AND HONESTLY AS POSSIBLE. MAKE SURE YOU ADD IN ONE SECTION: THAT YOUR WRITING NEEDS TO MATCH YOUR SMART THINKING-ACROSS SUBJECTS. THIS IS AN ACADEMIC BEHAVIOR GOAL. Develop an understanding of the interdependence of individuals and groups in communities in the western hemisphere. STICK TO ONE THEME-BIG TOPIC. PERIOD THREE: WORK ON YOUR PARTNER WONDER ACTIVITY QUIETLY. POSTED IN SOCIAL STUDIES SECTION OF THE WEBSITE. PERIOD FOUR: CLUBS-RAZ KIDS-ELA I-READY. Imagine you have encountered someone who says they will not vote in the midterm elections because they do not think it is as important as the presidential election. Do you agree or disagree? Why? PERIOD SIX: WORK ON MANGO STREET ESSAYS (SEE PERIOD TWO FOR MORE SPECIFIC DETAILS). PERIOD SEVEN: WORK ON YOUR PARTNER WONDER ACTIVITY QUIETLY. DUE WEDNESDAY. PERIOD EIGHT: MAKE SURE LAPTOPS ARE PROPERLY PUT AWAY. Please revisit the Sandra Cisneros short story, “Eleven”, by Sandra Cisneros. Using what you notice about the way the narrative is crafted, create your own TEN or ELEVEN stories in which you demonstrate your multiple “years” of your ten year-old self. Try to incorporate figurative and descriptive language into your writing. Remember to change paragraphs, every time someone is speaking or there is a movement in time or place. Keep in mind what message-theme-big idea you want to share with your readers and what you want to reveal about yourself. If you already created a similar piece, begin typing and we will work on revising it. MAKE SURE YOU HAVE FINISHED YOUR "HOUSE ON MANGO STREET" PACKET #4. WE WILL DISCUSS THE EXTENDED METAPHOR VIGNETTE, FOUR SKINNY TREES TOMORROW. Where were the seven wonders of the ancient world located? Which of the seven wonders of the ancient world still exist today? 5. DO NOT BORROW BOOKS FROM THE LIBRARY UNLESS YOU SIGN THEM OUT, HAVE LOGGED OLD ONE INTO YOUR BOOK LOG AND PUT THEM BACK WHERE THEY BELONGS...YOU MAY READ QUIETLY AND LOG INTO READING LOGS FOR 20 MINUTES. PLEASE PRACTICE "READING WITH A THEORY IN MIND..." IN OTHER WORDS, WHAT IS THIS BOOK REALLY ABOUT? Reading workshop: Reading with a Theory in Mind. Connect: Last week, we discussed the difference between theme-big idea-moral-message vs. plot-summary. Today we will learn that by previewing a book, we can predict its message or theme and use this message to help us read with a theory in mind. Teach: We are book detectives. As we read, it is our jobs to gather evidence to support our themes. Remember, we must ask ourselves, what life lesson does the author want to teach us? Some other words that mean the same are: theory, message, main idea, big idea and moral. When we talk about big idea, we do not mention characters or events from the story—not yet. We consider the life lesson we learn. One way to do this is by previewing the book’s blurb, back cover or insider jacket. Very often, this information will tell us the message. It may be in the summary or in critics’ reviews of the book. . In addition, if we have already read books by an author, we know that he or she usually writes about certain important issues like Roald Dahl--writes about "good" kids triumphing over "evil" grownups. Authors like Judy Blume write about how growing up comes with its special challenges So this helps, too. We can modify our theories about our stories as we go along. But we want to try to have one as we begin. It is then our job to gather evidence as we go along. Independent: As you read today, it is your job to read with a theory in mind. So before you even begin you must decide what the book is really about by previewing. You may change as you go along. Keep in mid a book may have more than one important idea. But it is your job to choose the one you think is strongest and gather evidence around it. Of course, you can modify as you go along. Connect: When we read stories about home, author does not come out and say what home means to her. She shows us by painting a picture with words and using the five senses. Today, we will closely examine how Cynthia Rylant does this effectively in When the Relatives Came. We will then try to write our own entries about home or a favorite place at home using details and sensory imagery. Teach: Reminder to make sure you write in a place you feel safe and comfortable). Then read Rylant story. Point out examples. Like for instance, during hugging time, the author gives lots of details. Cite other examples. Today, you will choose a specific place where you feel comfortable and safe. Write about a special memory-moment that took place in this special place. Perhaps it may be in grandmas’s kitchen. Try using a memory box to describe this special place (five senses and internal feelings). Then try writing about it in narrative form. Why is this memory-place-person so important to me? What is the unique role this place-memory-person plays in my life? Why does this memory-place-person mean more to me than it seems to mean to other members of my family? Have I always cherished this person-memory-place or has this changed over time? What do I want to say about this person-place-memory that I haven’t said yet? How does this memory-place-person fit into the whole of who I am as a person? Interactive: Turn and talk about a special place you may want to describe using sensory imagery and answering the important deep thinking memory questions. Independent: Using sensory imagery-five sense, integrate the important questions and narrative about a special place that holds a special memory. Share: Responses to questions and writing (probably will have to finish entries for homework). WRITE A LETTER TO JOHN LENNON OR TO THE AUTHOR OF THE BOOK ABOUT YOUR SECRET DREAMS AND WISHES AND HOW THIS TEXT HELPED INSPIRE YOU TO FOLLOW THEM!!! MAKE SURE YOU RESPONDED TO THE THEME IN YOUR STORY-TEXT...TOPIC....HOW DO YOU KNOW...WHAT IS THE LIFE LESSON HERE? WHAT AM I LEARNING ABOUT LIFE? HOW DO I KNOW?